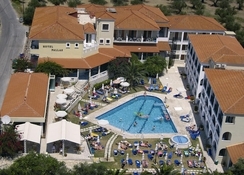 The Pallas Hotel is located in a stunning rural area on the outskirts of Laganas in Zante. This family run hotel offers a friendly and inviting atmosphere and benefits from excellent service and facilities. It is a 15 minute walk from Laganas Beach and 750 metres from the resort area. This hotel is suitable for couples and families looking for a quiet and relaxing holiday. The hotel has recently featured in the UK press as ‘the place to stay in Zante’. The facilities include swimming pool, sun beds, outdoor shower, pool bar serving drinks and freshly prepared food and snacks, breakfast room, reception area, car rental, taxi arrangements, Internet corner (at extra charge), WiFi in public areas (at extra charge), lounge with satellite TV, pool tables (extra charge), table tennis(extra charge), weekly barbecue, disabled access and lift. The rooms feature individually controlled air-conditioning (payable locally), TV, telephone, hairdryer, fridge (payable locally), bath or shower room and balcony or terrace. Cots available free. Safety deposit (extra charge). Meals:Breakfast, Buffet, Restaurant, Daily: 08:00 - 10:00.Lunch, Buffet, Snack Bar, Daily: 12:30 - 14:00.Dinner, Buffet, Restaurant; Dress code applies (no shorts/swimwear allowed), Daily: 19:30 - 21:00.Afternoon Tea; Coffee Break, Snack Bar, Daily: 16:00 - 17:00.Drinks:Locally produced Alcohol; Locally produced non Alcohol, Soft drinks; Red Wine; White Wine; Draught Beer; Brandy; Ouzo; Mineral water; Tea; Coffee, Restaurant (Served during meal times only), Daily.Meals:Snacks, Pool Bar, Daily: 12:30 - 14:00.Dinner, Buffet, Restaurant; Dress code applies (no shorts/swimwear allowed), Daily: 19:30 - 21:00.